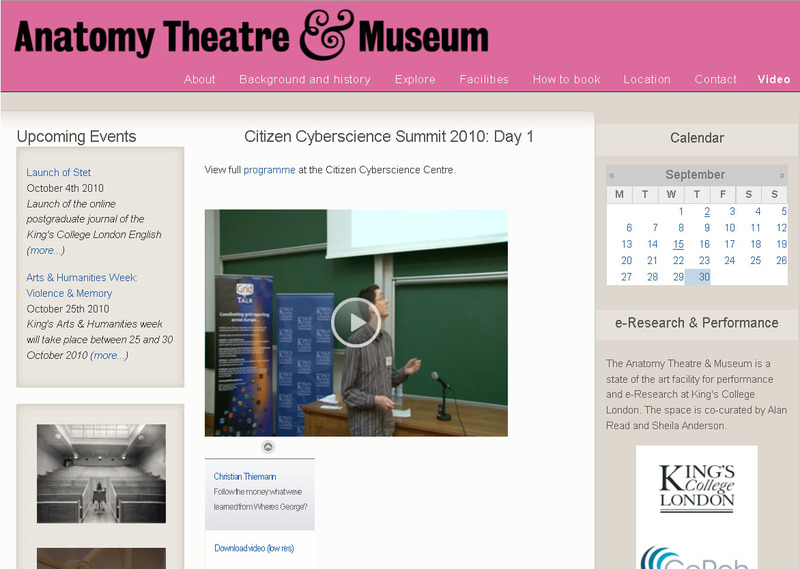 For anybody who missed out on the fab talks at last months Citizen Cyberscience Summit now's your chance to catch up! 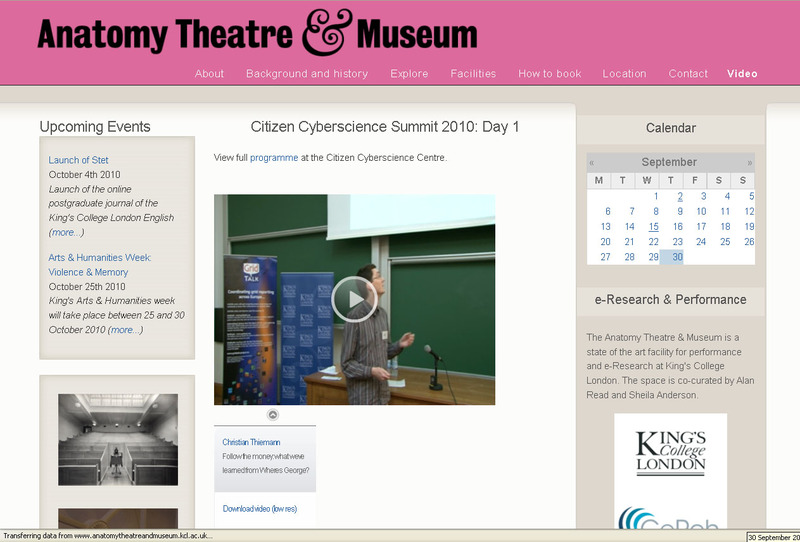 We've put videos of all the talks from the two days up onto the Anatomy Theatre website especially for you. And as an added bonus all the slides from the talks are on there too. During the two days of the summit we encouraged people to contribute via twitter and to use the #cybersci hashtag. We have collected all of those tweets into this post (yeah it's a long one). You can get the entire archive of tweets from here. You can see more after the jump. So it's the end of the very first Citizen Cyberscience Summit here in London and, although the event has been full of discussion, I think everyone can agree that we've had a successful couple of days. To round up the Summit we had a quick chat with Francois Grey, coordinator of the Citizen Cyberscience Centre and one of the brains behind the Summit. Watch below for Francois' thoughts on the event and what he thinks we've achieved in the last two days. One of the projects presented this morning was AfricaMap, a Citizen Cyberscience Centre project, which aims to use volunteers in Africa to create maps for Africa. We chatted to Peter Amoako Yirenkyi who told us a little more about the project. This morning we've been hearing about volunteer computing projects in the pipeline. From solving Suduko puzzles to creating detailed maps of Africa, the possibilities of citizen cyberscience appear to be endless and there are some amazing ideas coming out of the Summit today. However, if you're not lucky enough to be at the Summit yourself, there's still plenty of ways to keep up with all the action online. We're streaming the talks live on the web at the King's College Anatomy Theatre and Museum website. And for those of you in America or Australia, we're also hoping to archive filmed versions of the talks, plus the speakers presentations after the Summit is over, so there's no need to wake up before sunrise or stay up until the wee hours of the night. For a quick snapshot of the attendees thoughts on the speakers and talks take a look at Twitter, just search for the #cybersci tag. And last but not least don't forget to keep checking the blogosphere. 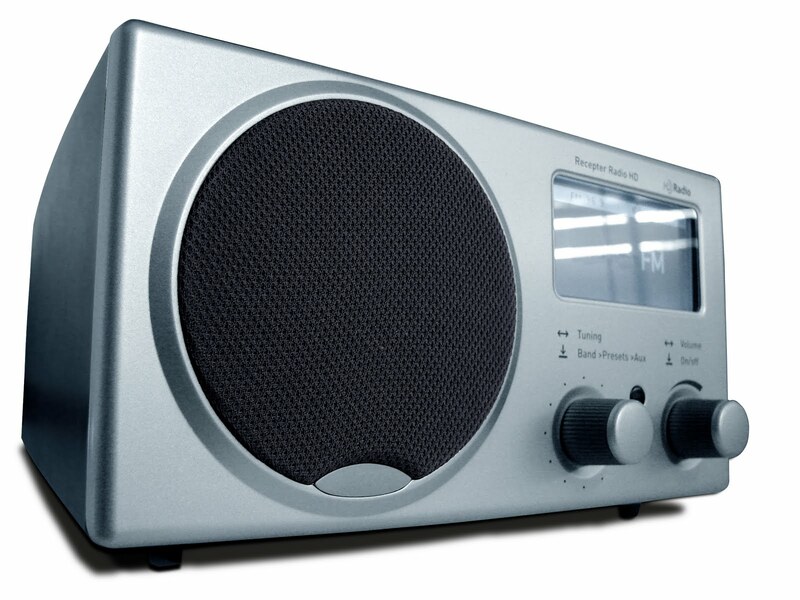 We'll be updating this blog throughout the day. There are also some great summaries of all the speakers talks on Suw Charman-Anderson's blog, Strange Attractor, check it out here. Today at the Citizen Cyberscience Summit in London has been one of the most lively and entertaining events I’ve attended in ages. Under the banner of citizen cyberscience in all its guises, we’ve heard about human computers from David Grier, finding prime numbers from PrimeGrid, now running to hundreds of thousands of digits, and from the founder of BOINC and SETI@home, David Anderson. 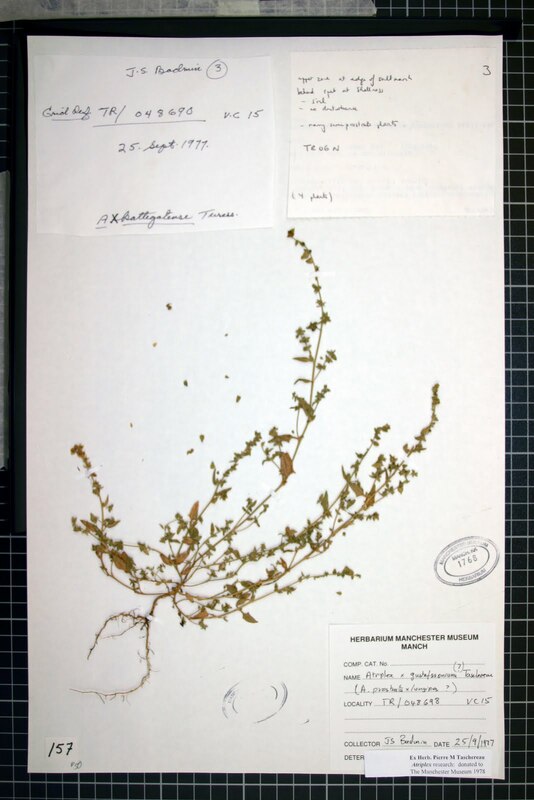 The story of herbaria@home struck a particular chord as well for me – as a former museum curator in a previous life, the idea of using volunteers to help catalogue otherwise inaccessible botanical collections seems like an inspired idea. Instead of spending several weeks in a darkened museum cupboard cataloguing 200 pairs of 19th century spectacles, as I found myself doing a few years ago, today I could have asked a team of enthusiastic volunteers to give me a hand from the comfort of their own homes. Among a host of enthusiastic presenters, a highlight for me was Becky Parker’s energetic presentation on building cosmic ray detector networks in schools. Through regular trips to CERN her class has had a unique insight into the world of particle physics and cosmic rays – a far cry from the experiments we did in school rolling little trucks down slopes attached to ticker tapes. Becky introduced us to the CERN@school initiative, which sends Medipix detector chips, as used in the Large Hadron Collider, into schools. A pilot group of schools in Kent are using these chips to gather data about secondary cosmic rays in the atmosphere, and Queen Mary University’s GridPP project is helping them to process the data. Hopefully this is a pilot that will take off into a whole host of schools, bring cyberscience to the citizens of tomorrow. Citizen cyberscience projects don't just help physicists and astronomers. Scientists from all sorts of disciplines can benefit from the efforts put in by citizens across the world. With this in mind, this morning we heard from Tom Humphrey of the Botanical Society of the British Isles who explained how volunteers are helping to classify UK plant specimens. His project, Herbaria@Home, asks volunteers to decipher plant specimen labels, providing information such as site name and date. This allows botanists to map these plants and track the spread (or not) of species across the UK. This provides vital biodiversity information which can be used for future studies of taxonomy, ecology, conservation and genetic biodiversity. For hard-to-read handwritten labels volunteers need an opportunity to collaborate and discuss with each other, so like many other successful projects Herbaria@home has a very active message board. All information provided by volunteers is open to peer review and can be edited, with the public edit history accessible to all. 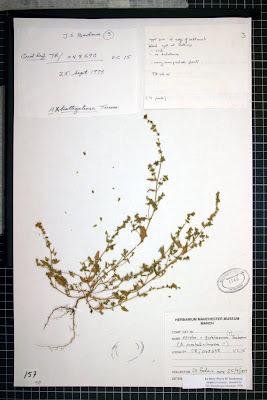 As an added bonus, uploading these plant specimens onto the internet for analysis, means that Herbaria@home is opening up the museum's collections of plant material, which are otherwise largely inaccessible. To date Herbaris@home has classified a total of 70,000 species and looks set to continue well into the future.